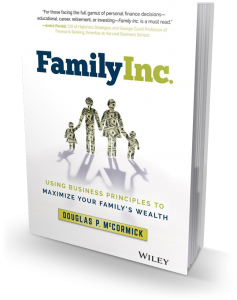 Family Inc. - Family Inc.
Family Inc. is not just a personal finance book; it is a “how to” guide for achieving financial security and wealth. By borrowing time tested principles used in business and applying them to family financial planning, Family Inc. provides a powerful framework for navigating all of life’s big financial decisions. You will learn how to think strategically as the Family Chief Financial Officer; how to make investments in education and yourself to benefit your career; how to manage your hard earned money to make it work for you; how to use financial products like insurance, investments and debt; how to think like an entrepreneur; how to achieve peace of mind in retirement and how to teach your family these important life skills. Every family needs a CFO to navigate the “financial game of life”, and the principles of corporate finance apply from the boardroom to the living room. Family Inc. delivers practical, actionable advice in the form of CFO training to help you plot a real-world family financial plan. Sign up to create your customized CFO Dashboard, access powerful financial planning tools & download a free sample chapter of Family Inc. Learn more about Family Inc. through national media coverage from reviews, interviews and author writings.